We worry, so you don't. 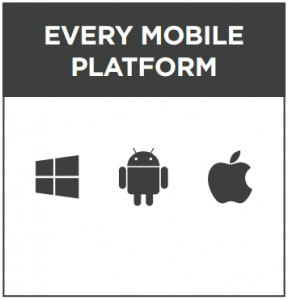 Kare for Mobile is much more than clever software that controls your mobile devices. It includes ongoing management of your devices - ensuring anti-virus is in place and making sure backups of all data is occurring. Get all the help and support you need as quick as you can say "call Kinetics" into your smartphone. 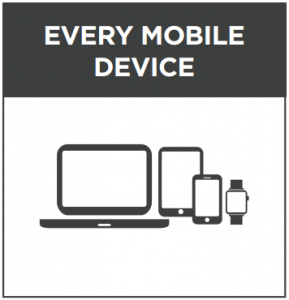 See an overview of all your devices and where they are. Full asset register with integrated reporting on devices. Enable ’Bring Your Own Devices’ yet retain full control. Remotely wipe lost/stolen devices to remove sensitive company data. Push applications and anti virus to your mobiles. Back up data remotely to ensure control. 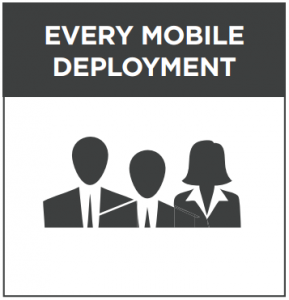 Reduce the cost and complexity of deployments. Manage applications and compliance. Push company settings (email, Wi-fi and VPN) with company policies (3G, roaming, hotspot). Are you in control? Can you answer all these questions? KARE for mobile tracks devices every 15 minutes, giving you valuable health & safety information. See a full asset register with integrated reporting. Device profiles enable a Bring Your Own Device policy whilst retaining control. 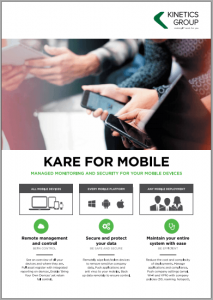 Anti-Virus is included in KARE for Mobile along with password protection policies. Remote wipe lost/stolen devices and remove company applications. Profiles can restrict app installation and check for compliance. Profiles give control of data access, roaming, browsing, usage and more.